A salad fit for an Emperor. 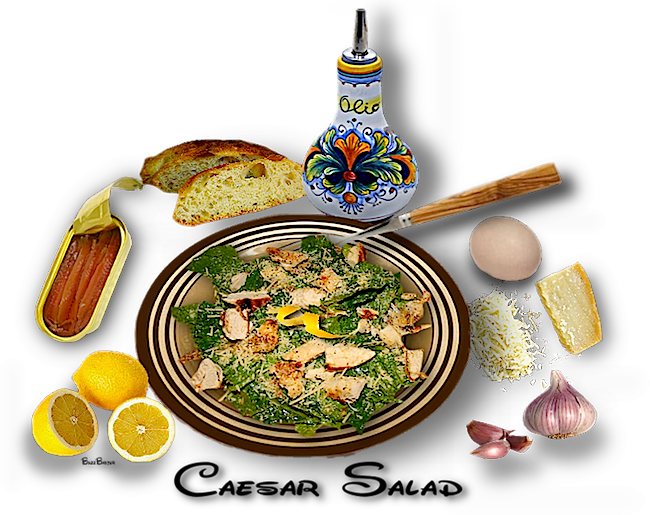 Caesar salad can be made in a various number of ways. You can have chicken Caesar, salmon Caesar, shrimp Caesar, mixed seafood Caesar, or just a plain Caesar as described in the following recipe. As an extra bonus, I have listed a few other of my favorite Caesar salads by some Celebrity Chefs. knife (be careful) or with a garlic press. Slice up the baguette and cut them into ½ - ¾ inch cubes. yourself if you have the opportunity. capers in a bowl. Crack egg and add to these ingredients. Whisk until smooth. smooth. Reason: if you add the oil too quickly, the dressing will be separate and not emulsify. 2. Serve on chilled plates. anchovies,  add another ½ teaspoon of Worcestershire sauce.